Build confidence in your own British Pound strategy with the help of our free guide! The British Pound was the worst performing major on Tuesday as it became increasingly clear that the revised Brexit deal the UK government secured 24 hours ago would fail to pass in Parliament. Ahead of the crucial vote, UK Attorney General Geoffrey Cox noted that the legal risks of Theresa May’s divorce deal remained unchanged. This sent GBP/USD to session lows. 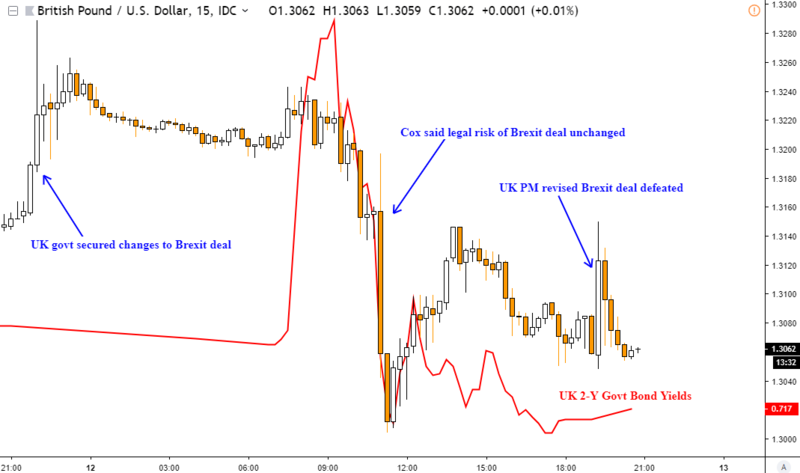 On the chart below, once the UK Prime Minister’s Brexit deal failed to pass in Parliament for a second time (242 ayes versus 391 nays), Sterling trimmed some losses but ultimately came right back down to square one. 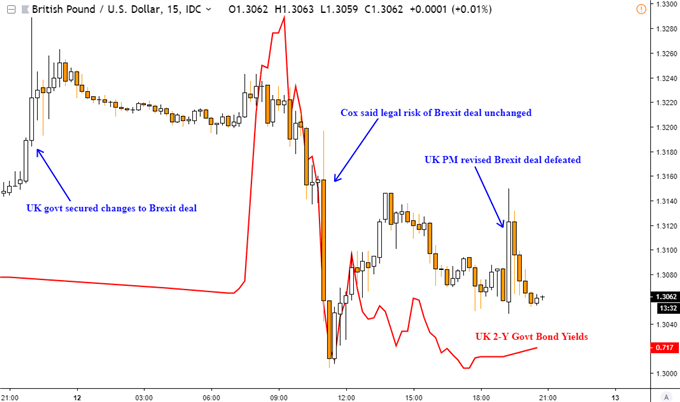 The anticipation of an extension for Brexit had already been priced into the markets, which might be the outcome if ‘no-deal’ Brexit is rejected tomorrow. But that opens the door to numerous uncertainties ahead such as a second referendum, no Brexit or going back to Brussels for more renegotiations. The latter has been rejected by prominent EU officials, such as Jean-Claude Juncker. He noted that there is no third chance to pass a divorce deal. With that in mind, technically speaking, GBP/USD remains in limbo after failing to breach late-February highs. The S&P 500 continued correcting higher after prominent losses last week, boosted by the latest headline US inflation report. There, CPI (YoY) clocked in at 1.5% which missed the 1.6% estimate. US government bond yields tumbled, reflecting increasingly dovish Fed monetary policy expectations. But, all else considered, the US Dollar emerged relatively unscathed by the end of the day. The disappointing inflation report may have been partially offset by weakness in the British Pound. 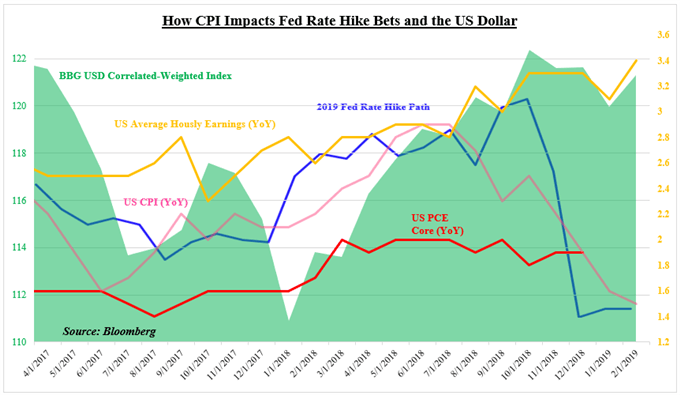 Moreover, looking at the next chart below, the Greenback has held up relatively well as average hourly earnings continue surprising higher and PCE Core - the Fed’s preferred measure of inflation - stabilized. 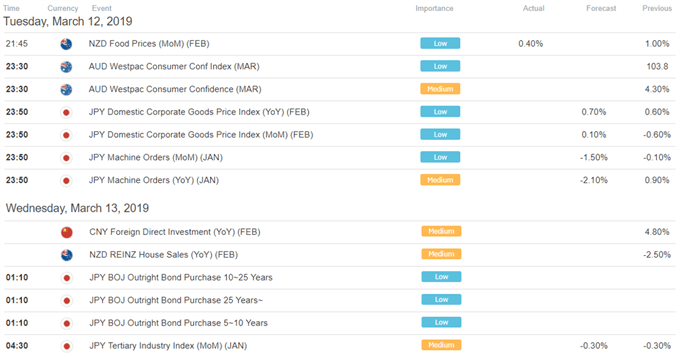 In fact, higher rates in the US may be weighing down on headline prices for now. This is a natural byproduct of the central bank’s tightening cycle that began back at the end of 2015. S&P 500 futures are now aiming cautiously lower, which perhaps suggest that gains in Asia Pacific benchmark stock indexes could be limited after a rosy day on Wall Street. At this point, with Theresa May’s Brexit deal being rejected, odds and the threat of a ‘no-deal’ EU-UK divorce have arguably increased. 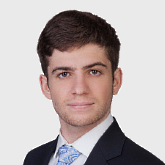 This natural uncertainty could fundamentally rob equities of lasting gains. Meanwhile, technical warning signs hint that indexes such as the Nikkei 225 and DAX 30 could still top.